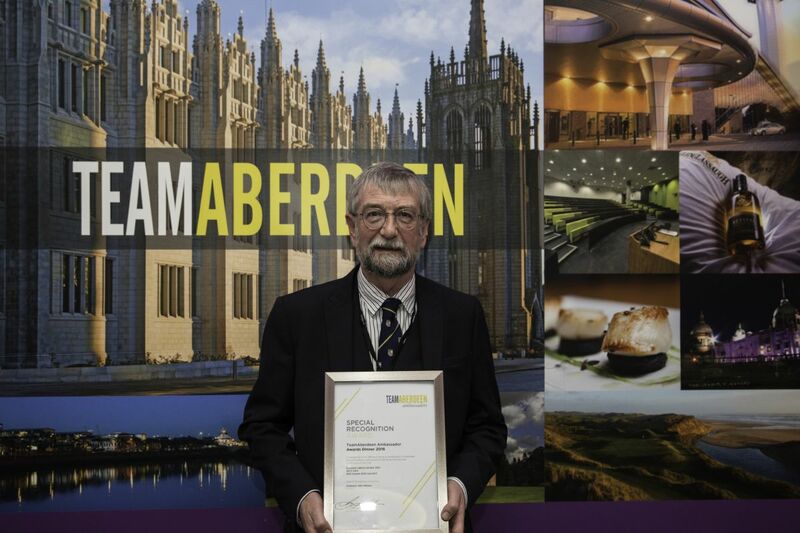 Professor John Watson recieved a special recognition award at the Team Aberdeen Ambassador Awards for his efforts in bringing conferences to the north east of Scotland. Ambassadors responsible for bringing high profile conferences to the north east were on Wednesday (11 May) recognised at an award ceremony in Aberdeen’s Chester Hotel. 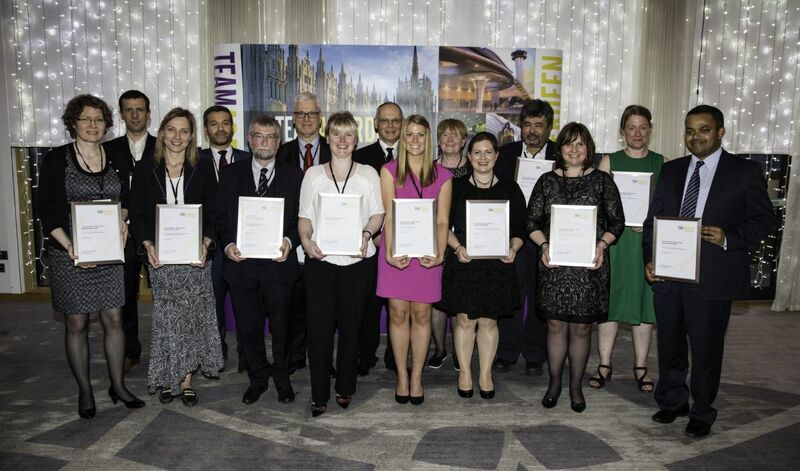 The annual Team Aberdeen Ambassador Awards celebrated the efforts of those who brought conferences on a diverse range of topics – including gene regulation, translation, rural sociology and marine technology – to Aberdeen and Aberdeenshire over the past 12 months. Twenty individuals received awards for their efforts in promoting the Aberdeen and Aberdeenshire to their associations, successfully bidding for and hosting 18 conferences in Aberdeen City and Shire over the past year. 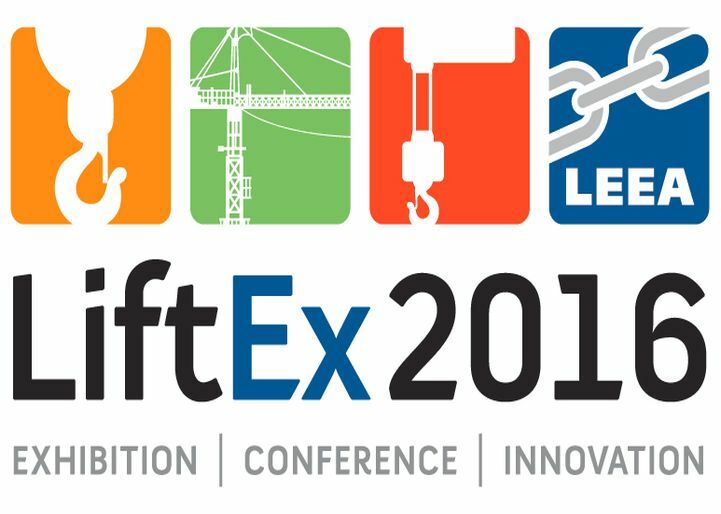 Such events have highlighted local organisations’ expertise within a diverse range of subject areas, and have helped to promote the north east as an attractive conferencing destination. A special recognition award was also given to Professor John Watson of the University of Aberdeen. 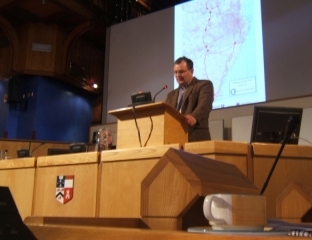 Throughout his career, Professor Watson has been an incredible ambassador for the region. This special award recognises the wide range of academic events he has brought to Aberdeen over the years, including the European Optical Society 2012, 3DTV 2013 and IEEE Oceans 2007 and 2017 conferences. “I am absolutely thrilled to receive this special recognition award, and it is fantastic to see so many of my peers’ efforts being recognised as well. Organising conferences on this scale requires the support of a strong team, and we are all grateful for the hard work of our colleagues in helping bring them to fruition. “Aberdeen is often called the oil capital of Europe, and many know about the large energy industry events which take place in the city. While the energy industry is obviously valuable to the region, it is important to realise and celebrate the diverse range of academic events that also take place. “From Latin American studies to cement and concrete technology, the breadth of conferences held in the north east over the past year is staggering. It shows that Aberdeen and Aberdeenshire have a lot to offer in a diverse range of important research fields. “The success of these conferences highlights the excellent facilities that the north east has to offer. “From the Aberdeen Exhibition and Conference Centre for large-scale conferences to the hotels and exclusive use venues which host smaller meetings and events, the region has a lot to offer those looking for somewhere to hold a successful conference. Team Aberdeen Ambassadors is a collaboration between VisitAberdeenshire, University of Aberdeen, Robert Gordon University, James Hutton Institute and Aberdeen Exhibition and Conference Centre, working together to increase the level of national and international association conferences being held in Aberdeen City and Shire. The Team supports individuals who can influence their own professional association in bringing events to the north east. Plans for a brand new festival that will bring Speyside’s whisky producers together under one roof for the first time were highlighted at a major tourism conference on Wednesday. Festival manager Pery Zakeri (pictured) said the three-day event taking place in the area’s capital town of Elgin from September 9 – 11 would deliver a boost to tourism businesses, bringing more visitors into the area at a time when the traditional summer season is drawing to a close. 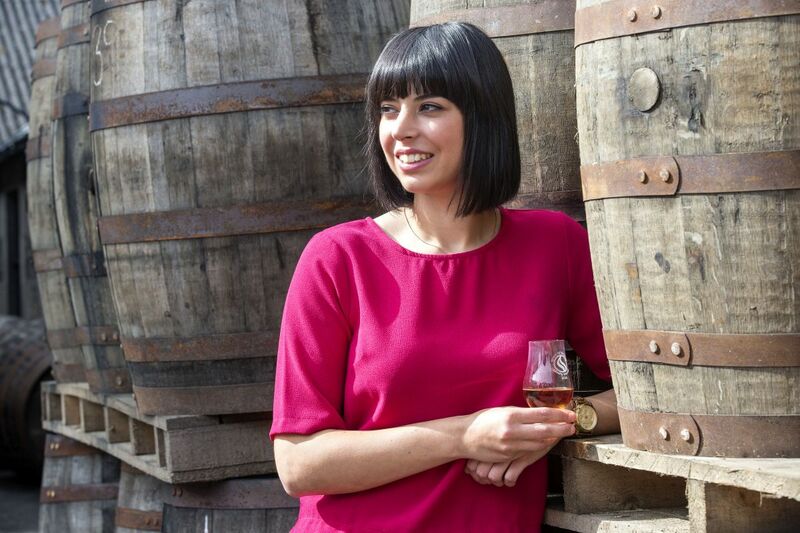 “This is a brand new weekend for Moray Speyside and we are hoping to attract a new, younger audience that will be different to the audience we attract to the May festival. Aberdeen is a city on a downward slide. That makes for uncomfortable reading, doesn’t it? Our gut instinct, being the proud city we are, is to reject this notion out of hand, though deep down we all know it is true, says Graeme Campbell. The cause of the rot is not easy to identify. Opinions will differ and any debate would most likely be fierce. It is perhaps best to say the gradual slip in the condition of our once grand and glorious city can be pigeon-holed to two vague categories – poor planning and the slow decline of the energy sector. Or perhaps over-dependence on it? Two and a half pigeon holes then. So, avoiding any unhelpful debate surrounding the way we arrived at this point, we must as a city look forward to the best possible route to a future of prosperity. We must look for a plan to return grandeur and pride to the Granite City. Our carefully-selected councillors, together with possibly our most successful loon, Sir Ian Wood and the private partnership Aberdeen City and Shire Economic Futures (ACSEF) think the solution to the gradual slip is a new garden. Not exclusively a garden you understand, but a garden with conferencing facilities and a café. To give all credit due, the plans certainly are impressive and whilst perhaps not so impressive in keeping with the architectural fabric of the city, we are, of course, a city not afraid of change. In the most recent release posted through all city letterboxes, Aberdonians are directed by a host of interested parties to the key point, “You deserve it!” Well yes, most likely. But oddly, relegated to fifth, is what will be the key point for most Aberdonians. Once again we don’t want to admit this but we’re all thinking it, “We can afford it”. Will Aberdeen City be pushed to the very brink of bankruptcy by this plan, as happened when the city took the bold decision, so long ago, to construct our now famous Union Street granite mile? Probably not. 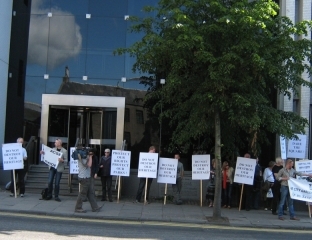 Of course, Sir Ian’s mammoth oil wealth will go some way to meeting the cost of development on the site – and only on this site, he has been quite clear on that point – the further estimated £100m will come from business rates, council tax – of course – and the heinously-complex Scottish Governmental TIF funding mechanism. Now nobody wishes to be bored to tears by the inane workings of a TIF, so let’s not worry about that. Instead, let’s find out what other places are using TIF to create. North Lanarkshire plans to spend £73m to transform the former Ravenscraig steel site, an area of quite unrivalled deprivation, to the benefit of the many people who live in the area. Argyll and Bute is to extend the North Pier at Oban for £20m, further securing the town’s position as Gateway to the Islands, a major boon to the tourist industry no doubt. Falkirk plans to use its TIF in a far less grand manner, by bringing about strategic road developments and improving the flood defences. Clearly a sound decision. But the plans which should be of most interest to any outward-looking Aberdonian comfortably seated in Europe’s oil capital, come from Fife. The council there is to spend its modest £17m TIF improving vehicle and marine access to the already-thriving Energy Park Fife, where renewables are already being constructed. I know, that’s not oil, but it is very real, so let’s not sneer. Not content with this, Fife has also begun construction of the Levenmouth Low Carbon Investment Park which is set to become ‘Scotland’s foremost energy park’. 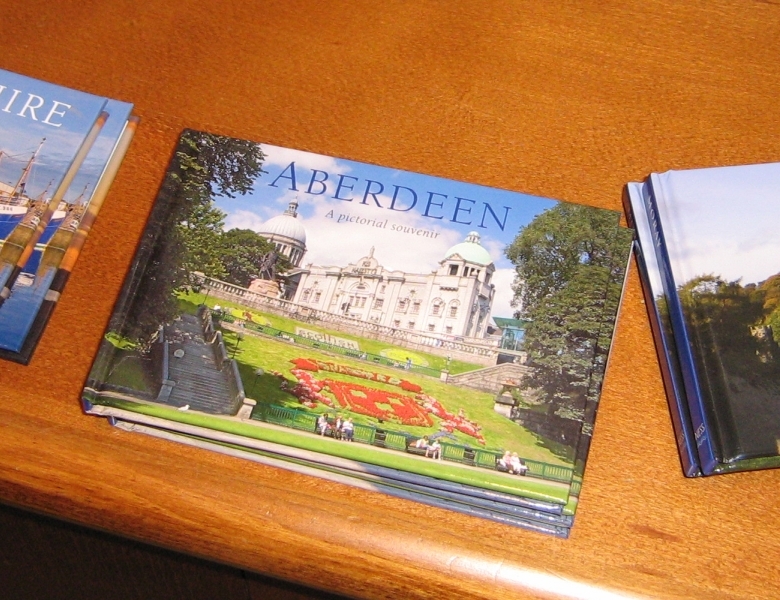 Whilst in Aberdeen we plan to spend £150m on a garden and café. Is anyone else embarrassed? Our great city, the economic powerhouse of Scotland, is being distracted by plants and trees whilst other towns are going green in a wholly more financially-sound way. This city has the engineering and science skills, brought by the oil industry and our two modern and diverse universities, to become a world leader in the renewables field. You don’t need to do the math to know a research and development centre, alongside a manufacturing park would be of significantly greater financial gain to the city than the redevelopment of a garden. This brings us to the question – has the Council considered this? Understandably, Sir Ian may not be keen, but this is about so much more than the oil empires held by the few; this is about the continuing prosperity of the many. So, as the ballot papers find their way to you, look around the city. Look for the signs of the rot brought about by poor management by those who, for too long, have only looked inwards – decision makers enjoying the security of the formerly-booming local oil industry. Consider what the world, given the current environmental and economic climate, would look to Aberdeen for. Horticultural tips? A show in our new 5000-seat outdoor amphitheatre? Or will they look to Europe’s ENERGY Capital to lead the way to a bright new future of renewable energy? And then, as our city leads the world in technological advancement in the renewables field we will look forward to investment, to jobs and to success. When the ballot paper lands on your doormat, consider what Aberdonians truly deserve and ensure your vote lets our council know just what you want for your future. With Thanks to Linda Allan. The lilting strains of “Harmonise the World” with its powerful musical message for today’s world, can be heard at the close of every gathering of the body of women singers called Sweet Adelines International. Audience members in Deeside will be treated to an example of this international spirit this autumn, when the Jazz Group Conference-of-Swing from Dresden and Aberdeen Chorus of Sweet Adelines team up for two evenings of lively Jazz vocals and superb close harmony. 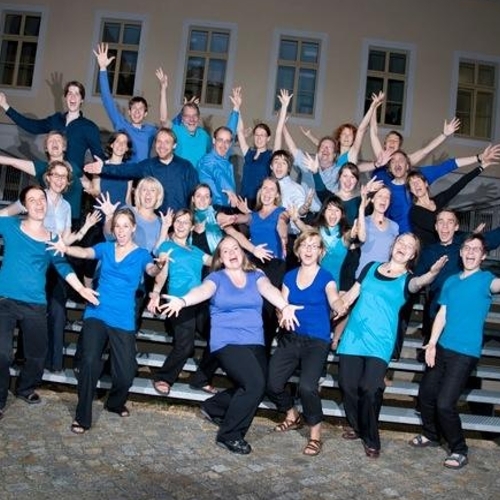 This all came about when Riki Gohrbrandt one of the German Jazz Group, found an outlet for her musical talent by singing with the Aberdeen Chorus in her spare time while working for a year as a Foreign Languages Assistant in Aberdeen. She enjoyed the experience so much, and had become such firm friends with the singers, that she was determined to keep up her links with the Chorus and encourage her fellow singers in the Jazz Group to consider a trip to Scotland culminating in a joint concert with her musical friends from last year. Several months and many reams of emails later, this plan has come to fruition. The Aberdeen Chorus – fresh from their success at the Edinburgh Fringe and their Show in the Music Hall Aberdeen – is soon to play host to the group of 25 talented singers from Dresden, and provide accommodation with lots of sightseeing opportunities, culminating in two concerts in the Banchory area. 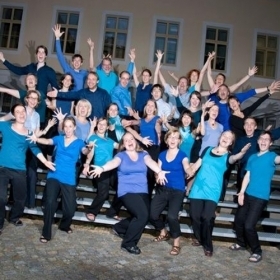 On Monday 3 October at 7:30pm the two groups will make music together in Peterculter Church. Both groups are particularly excited not only about the chance to hear each other, but also the chance to perform together as one and demonstrate to audiences what is so near to all singers’ hearts in the lyrics of “Why we sing” with its echoes of “Harmonise the World”. On Tuesday 4 October at 7:30pm, Riki will sing with her group Conference-of-Swing at the Woodend Barn Banchory. 4 Quartets from the Aberdeen Chorus, Vocal Zone, Shindig, Chimaera and Singularity are also excited about sharing the stage then and this promises to be an entertaining and very harmonious event. Tickets £8(£6) for the Peterculter Event from Peterculter Church, Riah Hair Design, Bridge St. Banchory, Kathy Davis 01330 823967, and at the door. A document has appeared purporting to reveal and counter ‘myths’ about the proposed Union Terrace Gardens development. It has been posted on the Aberdeen and Grampian Chamber of Commerce (AGCC) website. Some of the claims are disingenuous and others stretch the idea of a ‘myth’ somewhat. A media quote picked at random clearly shows that it has invariably been perceived as Sir Ian’s project. So exactly whose vision is it then, Sir Ian? Excuse me, I don’t think so. The development will destroy the existing Gardens and according to the technical feasibility study, all 78 mature trees including the old elms will be chopped down. It is hard to accept that the new “City Garden” could ever support mature trees on the existing scale. …to be built in place of the Victorian park. 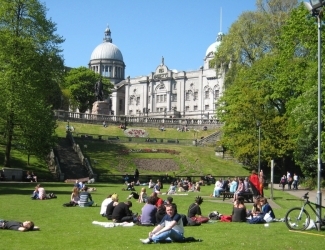 Union Terrace Gardens was planned by Alexander Marshall Mackenzie, who also designed many of the surrounding buildings including the Art Gallery. 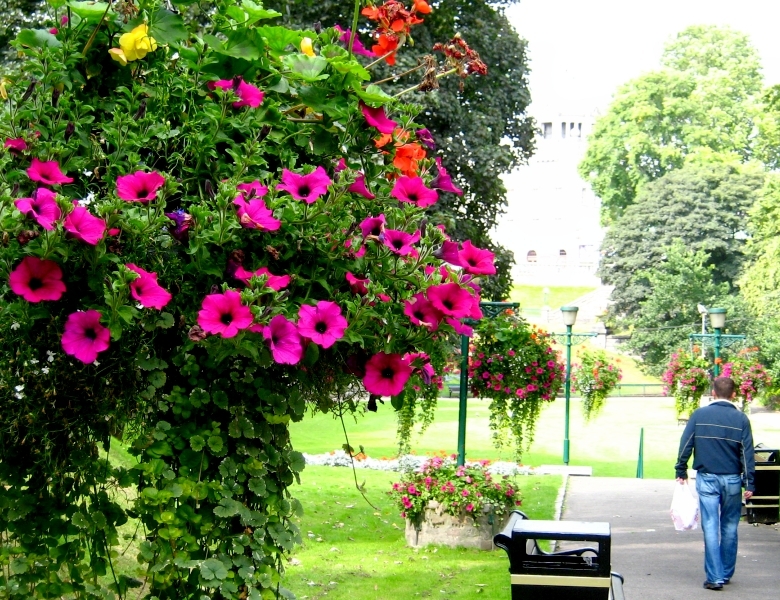 If Union Terrace Gardens feel as if they belong, this is the reason why. The city square WILL destroy a key part of our history and heritage. This is misleading as it doesn’t explain the whole picture. The land will most likely remain with the Council for the time being. However, the ground will probably be leased for a long period, 125 years has been suggested. A lease-hold on this time-scale while technically not ownership, is nevertheless a significant property deal. Any structure on the land, including the so-called City Garden, will not be publically owned. This will belong to the private company or trust if they get planning permission. We know that considerable Council officer time has been allocated to work spent on the project. We do not know if the City Garden Project intends to reimburse the Council for this or not. ACC minutes show that the Council lawyers have not yet signed off the relevant project agreement that would allow this to happen. Doh! – “Fiction: The City will be taking on-board future liabilities” but then we are told “This will involve the City borrowing funds to invest in the project”. The Council are £562M in debt and cannot afford any more borrowing for anything. As has been explained on these pages before by Mick Miller, the version of TIF suggested for the City Square Project involves major financial risk. If the amount of business rates does not increase sufficiently to pay back the loan, then the Council get left holding the baby. This is probably the most outrageous of the so-called myths. A public consultation was held, the public voted No by a significant majority and it was ignored. The public were told that their votes would count. Even Sir Ian Wood acknowledged this in an interview as can be seen on an STV located on Youtube. The statement that the majority indicated a need for change is misleading, the majority said no to the City Square Project and did not endorse it. If the public were misled during the consultation, who was responsible for the misinformation? Where did these myths come from? The proponents of the City Square do not accept that they lost the consultation fairly. They cannot believe that the public cogently preferred either the Peacock scheme or the preservation of the existing gardens to a modern city square. But this is what happened. OK guys, explain to me how you can ”raise the level of the Gardens to that of the surrounding streets” (the Council’s words not mine) and use the existing topography to any significant extent? So where did the idea of a unique and dramatic setting come from? I suspect that this is just the start of a large PR campaign to sell the concept of the “City Garden Project” to the Aberdeen Public. It will have only a limited impact. 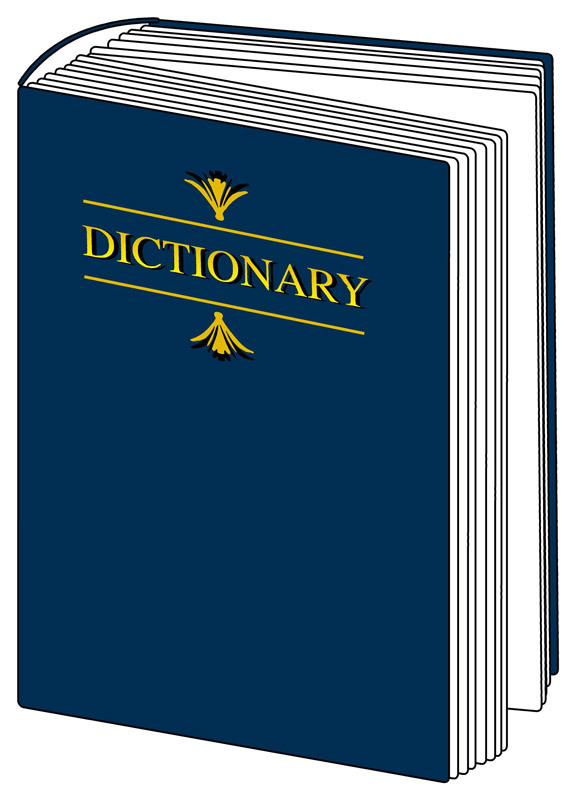 Aberdonians are highly educated and can think for themselves. 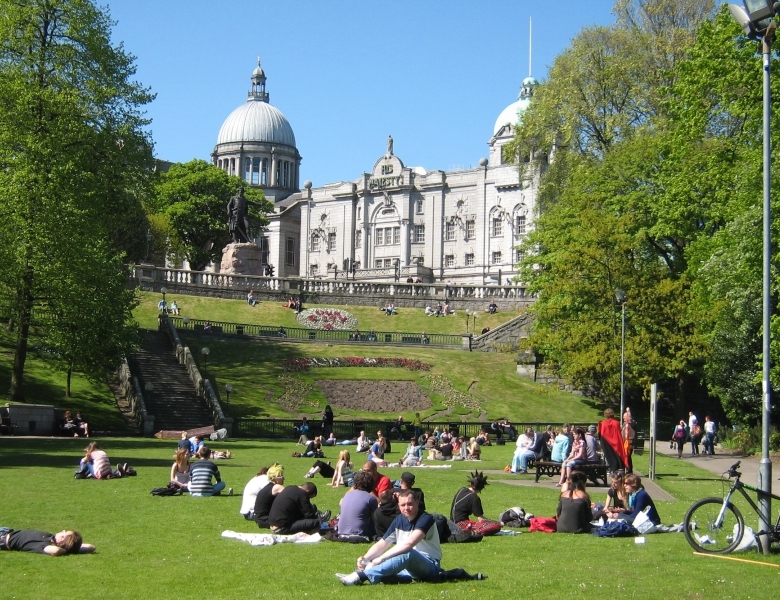 They can make their own mind up about what they want the city centre to look like, whether it is the existing Gardens or a city square at street level. They are smart enough to see what is plausible and what isn’t. 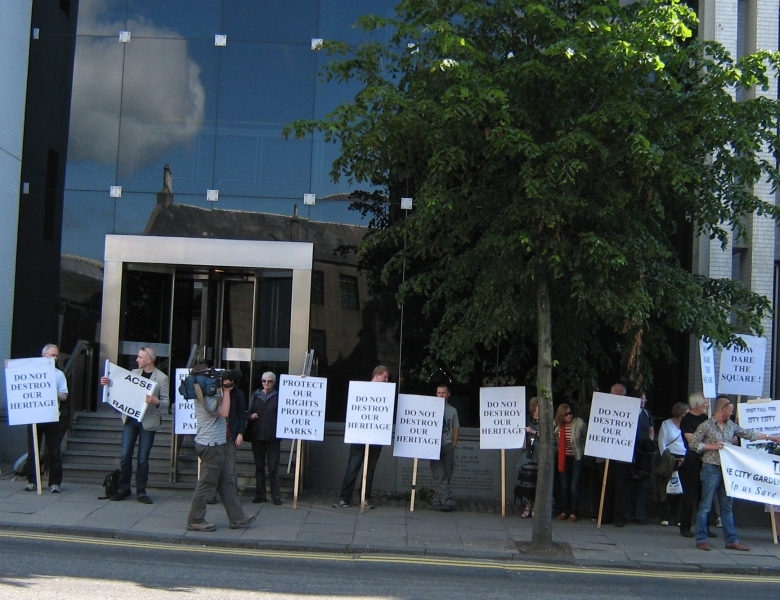 Aberdeen Council: Where’s The Brief ? Six architects are busy designing a modern square and a subsurface concourse for the proposed development of Union Terrace Gardens. The public can expect to see these designs in early October. The architects have been given a design brief by the project implementation team for the City Garden Project, telling them what it is they are expected to design. Only part of the brief has been made public; most of our councillors still have not been fully informed as to what the architects are being asked to do with our public, open, green space. “I reported to the Project Monitoring Group what was intended at the time of the meeting. However, it was subsequently decided, by members involved in determining the Agenda for Council meetings, that there was no need to obtain Council approval for this and that it should go to Council as an attachment to the normal quarterly City Garden Project Bulletin report. This was repeated in a letter in the Scotsman and later partly republished by Private Eye. The result was a major row in the council chambers, which still has not died down yet. Some councillors and council officials were very upset at the statement that councillors had lost control over the City Garden Project. Others were annoyed that they had not been allowed to debate the design brief. Labour Councillor Willie Young asked a series of questions at this week’s Council meeting. This was not debated at the Council meeting on Wednesday. However, I’m told it will come up for discussion at a later Enterprise, Planning and Infrastructure sub-committee meeting. I would ask councillors to stand up and assert themselves on this issue. You are our elected representatives. There should be local democratic control over our public open green space, its function and its utility. It’s not up to a bunch of businessmen and their friends to decide what our city centre should look like. Nobody voted for them. Is control over the future of the City Centre and its Victorian Union Terrace Gardens falling into the hands of unaccountable, unelected agents? Mike Shepherd believes it is, and sends his thoughts to our Councillors. Council documents make it clear that you were expected to sign off the design brief for the City Garden Project at the full council meeting on June 29th. The design brief is intended not only to give specifications for the civic square covering the Denburn, but also to provide details for the usage of the large underground space beneath the square. 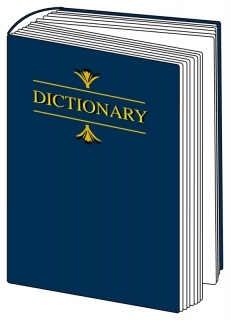 There is a problem however; the full specifications for the design brief did not appear to be ready in time for the 29th of June. Although a design brief has been issued, you have only been informed of the usage of only 6,000 square metres of the 56,000 square metres of accommodation space under the civic square (for an arts centre). There is also intent to provide conference, exhibition and meeting space of unspecified size. The open space is described as a contemporary 21stcentury garden. Given that these plans are designated for council-owned land, that the area is zoned as public green space in the local plan and the council have been asked to borrow £70million through a TIF scheme to fund it, then it would be reasonable to expect councillors to approve the specifications for the site. You have now lost control over the City Garden Project. A non-elected body has now made decisions as to what our city centre should look like. The intention is to hand out the design brief to short-listed companies for the architectural competition on the 21st of July. The next full council meeting is not until the 17th August. You have now lost control over the City Garden Project. A non-elected body has now made decisions as to what our city centre should look like. They have decreed that the Denburn should have a “contemporary 21st century garden”, not you. It is this body that is also deciding what the large underground concourse should be used for. If conference and exhibition facilities are to be provided, then this will clearly have implications for the future of the Aberdeen Exhibition and Conference Centre at the Bridge of Don. However, this is not a decision that you will have any control over unless you turn down the city square plans. The public should be extremely worried about the loss of democratic control over the City’s assets. The public were ignored when they voted against the City Square in a public consultation last year, now the powers given to our councillors are being bypassed too. I would ask you to assert your right to decide on our behalf what happens in our city. I would request that you insist that the approval or otherwise of the City Square design brief should be a matter for the council meeting on the 17thof August.